Kelly Gordon joined PNNL in 2000 and works in PNNL's Portland office. 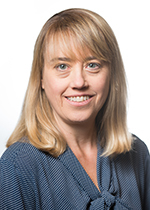 Kelly currently serves as PNNL Program Manager for the DOE Solid-State Lighting (SSL) program, and as Team Lead for the PNNL Advanced Lighting Team of 17 professionals. The SSL program conducts research on a range of technology and application issues related to semiconductor based lighting. The convergence of SSL and advanced control, information, and communications technologies is creating myriad new opportunities for improved energy efficiency, lighting quality, and new services and benefits for people in the built environment. The SSL program at PNNL is studying connected lighting systems, focusing on energy reporting, interoperability, cybersecurity, configuration complexity, and novel use cases. Further, the program is conducting research on color and vision science, the impact of light on human physiology, horticultural applications for spectrally tunable lighting, light pollution and sky glow, and the long term performance of SSL technologies. Before joining the Lab, Kelly worked for the International Institute for Energy Conservation (IIEC), a nonprofit organization in Washington, D.C., from 1993-1994, and 1996-2000. Key projects included energy market studies in Indonesia and the Philippines, and development and implementation of a six-country lighting efficiency program with the World Bank. From 1989 to 1993, Kelly worked for RPM Systems Inc. (now Retec), a consultancy in New Haven, Connecticut, where she supported energy conservation studies in public and private facilities, and managed a clean energy technology program for the State of Connecticut. Kelly's skills include project and team management, writing, and policy analysis. Her professional focus is on lighting energy efficiency and the development of high-efficiency lighting technologies and systems. She holds a Master's degree in Public Policy from Duke University, and earned the Lighting Certified (LC) designation in 2005, and the Project Management Professional (PMP) certification in 2012. Sandahl L.J., K.A. Cort, and K.L. Gordon. 2013. Solid-State Lighting: Early Lessons Learned on the Way to Market. PNNL-23059. Richland, WA: Pacific Northwest National Laboratory. Gordon K.L., R.P. Hafen, J.E. Hathaway, and J.J. McCullough. 2012. Lumen Maintenance Testing of the Philips 60-Watt Replacement Lamp L Prize Entry. PNNL-21594. Richland, WA: Pacific Northwest National Laboratory. Gordon K.L., and T.L. Gilbride. 2008. Illuminating Solar Decathlon Homes: Exploring Next Generation Lighting Technology - Light Emitting Diodes. PNNL-17597. Richland, WA: Pacific Northwest National Laboratory. Gordon K.L., G.P. Sullivan, P.R. Armstrong, E.E. Richman, and B.D. Matzke. 2006. Spectrally Enhanced Lighting Program Implementation for Energy Savings: Field Evaluation. PNNL-15784. Richland, WA: Pacific Northwest National Laboratory. Gordon K.L., R. Foster, and T. McGowan. 2006. "Lighting for Tomorrow: What have we learned and what about the day after tomorrow?." In 2006 ACEEE Summer Study on Energy Efficiency in Buildings, edited by John Busch and Ron Judkoff, 439. Washington, District Of Columbia:American Council for an Energy-Efficient Economy. PNNL-SA-49704. Johnson M.L., and K.L. Gordon. 2006. "LED Update." Residential Lighting Magazine. PNNL-SA-51073. Gordon K.L., R. Foster, and T. McGowan. 2005. "Lighting for Tomorrow: Building on the results of the first national energy-efficient lighting fixture design competition in the United States." In Right Light 6: presentations & programme : the 6th International Conference on Energy-Efficient Lighting, 9-11 May 2005, Shanghai, China, 12 pages. Shanghai:China Green Lights Programme Management Office. PNNL-SA-44480. Gordon K.L. 2004. "Today LED Holiday Lights, Tomorrow the World?." The APEM Advantage 7, no. 4:6. PNNL-SA-43550. Gordon K.L., and J.J. McCullough. 2004. "Can It." Professional Builder 69, no. 3:66-67. PNNL-SA-40476. Gordon K.L., and J.J. McCullough. 2004. "Recessed Downlights: A New Take on an Old Standby." BUILDERnews Magazine 18, no. 1:50-52. PNNL-SA-40613. Gordon K.L., R. Foster, and T. McGowan. 2004. "New Lighting Fixtures: Combining Creativity and Style with Energy Efficiency." BUILDERnews Magazine October, no. 2004:51-52. PNNL-SA-42808. Hoffman M., R. Foster, K.L. Gordon, and T. McGowan. 2004. "Partnering for a National Lighting Fixture Design Competition: The United States Experience." In Energy Efficiency in Domestic Appliances and Lighting: Proceedings of the 3rd International Conference on Energy Efficiency in Domestic Appliances and Lighting, edited by P. Bertoldi, F. Conti, and R. Pagani, 357-367. Turin:Softech. PNNL-SA-38933. Jones C.C., and K.L. Gordon. 2004. "Efficient Lighting Design and Office Worker Productivity." In Breaking out of the Box: Proceedings of the 2004 ACEEE Summer Study on Energy Efficiency in Buildings, August 22-27, Pacific Grove, CA, 3-112 - 3-123. Washington, District Of Columbia:American Council for an Energy-Efficient Economy. PNNL-SA-42858. Gordon K.L., and J.J. McCullough. 2003. "Recessed Lighting in the Limelight." Home Energy 21, no. 1:12-13. PNNL-SA-40522. Hollomon J., and K.L. Gordon. 2002. "Procuring High-Efficiency Air Conditioners: Harnessing Competition to Achieve Advances in Technology." In Globalcon 2002; Energy & facility management strategies and technologies, Philadelphia, PA, March 27-28, 2002, 5 pp. Atlanta, Georgia:Association of Energy Engineers. PNNL-SA-36035. McCullough J.J., and K.L. Gordon. 2002. "High Hats, Swiss Cheese, and Fluorescent Lighting?." In ACEEE Summer Study on Energy Efficiency in Buildings, 1, 171-182. Washington Dc:American Council for an Energy Efficient Economy. PNNL-SA-36485.